In-House or SEO Agency: Which is Right for Your Business? Search Marketing » Bruce Clay, Inc. Blog » In-House or SEO Agency: Which is Right for Your Business? In-House SEO or SEO Agency: Which Is Right for Your Business? Devising or revising an SEO strategy for your business and wondering whether or not to go with an in-house SEO or an SEO agency? It’s a common – and good – question to be asking. The answer depends on your budget and your goals. If it’s a matter of one or the other, however, it’s important to align the benefits of each and determine which is a better fit for your needs. Read on to find out more about the benefits of each option, with food for thought from our SEO manager, Robert Ramirez. An SEO agency is basically a think tank of highly experienced, savvy analysts. Their experience and talent, coupled with carte blanche access to premiere tools and extensive data, is an invaluable resource for any business. And there’s no surprising a strong SEO company — they are, after all, consumed with every aspect of SEO day-in and day-out. SEO agencies usually produce faster results because they have more experience. They’ve worked with hundreds (or thousands!) of clients in many industries. Search engine optimization agencies have a bird’s eye view of search. “There’s less guesswork because — whatever the problem is — they’ve probably encountered it before,” Ramirez said. Moreover, because SEO agencies work with multiple clients, they avoid the tunnel vision that an in-house SEO can be vulnerable to. “Sometimes it can be hard for an in-house SEO to see a site’s issues because they’re looking at it too much. An SEO agency can offer a fresh perspective,” said Ramirez. As far as cost is concerned, sometimes the hourly rate that an SEO agency charges can seem high. But with an SEO agency, you avoid the higher cost of maintaining an in-house SEO as an employee. An in-house SEO costs more than just salary alone — along with the salary, you are responsible for equipment, tools, education, benefits, etc. With an agency, those costs are not part of the package — you pay for the SEO agency’s expertise and time. An in-house SEO is thoroughly devoted to a business and focused on your brand 100 percent of the time. This SEO pro will have a robust knowledge of your industry, as well as your business’ unique needs. He or she is a go-to expert on search engine optimization and your business. Furthermore, the in-house SEO will have the advantage of working on-site with other team members. For businesses who are in the process of building brand identity, an in-house SEO can make a lot of sense. An SEO working in-house is up to his elbows in your business’ message and methodology. “They live and breathe your brand, which naturally makes them better equipped to represent the company’s message in marketing,” Ramirez said. At the end of the day, it all boils down to your budget and needs. Whether you choose to work with an SEO agency or work with an in-house SEO, make sure you do your homework and find an experienced, ethical and effective agency or individual. When interviewing a prospective analyst, we recommend asking these “25 SEO Interview Questions” pulled straight from Bruce Clay, Inc. interviews. If you’re looking to vet an agency, remember that a strong digital marketing firm should have an impressive track record of successful projects, longevity in the industry, seasoned SEO consultants on staff that are recognized leaders, and a reputation that speaks for itself. In your experience, what combination of in-house and consultant works for getting search marketing initiatives done? Share in the comments! 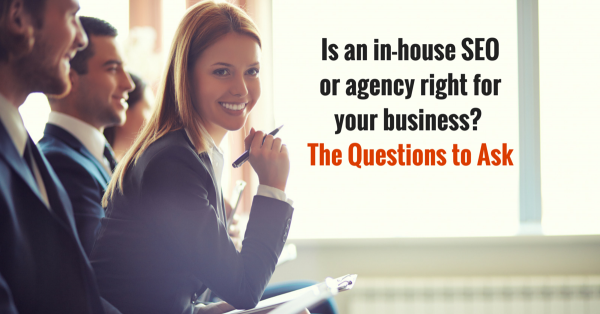 And for more talk on in-house vs. agency, check out this recent discussion from #SEMRushChat. SEO strategy really helps certain websites if its complexities and particularities can be handled in properly. What I feel is we need in-house SEO in order to keep our website safe, because I feel an SEO person can make or break as he/she will have every credentials related to our website which can be dangerous some time. Myself Karen, First of all I want to say that this is quite interesting post. Now this is very interesting that why I am calling this post interesting. Because, I am working with the agency which is also confused between “In house SEO” or “Hiring SEO Agency”. I am working on Inhouse Projects. So, finally decided to work with “Inhouse SEO” Thank god my job survived Haha jokes apart….!! But, ultimately I personally think that Inhouse SEO is best because we know that which direction we need to go and which ideas and prospects works fast and better for our business success. And there are bunch of advantages as well which Kristi defines here very well. I agree with you and I would suggest for hiring sep agency if you are startup or you have only one website. If you have more than one then you can hire sep people but you may not know instantly that they will deliver the good job. Where is SEO agency can give the best suggesitons having good seo expert. Very comprehensive article. Nice work on listing the pros and cons of both In house SEO and an outsourced SEO agency. I think hiring an professional agency will also enable anyone to get maximum result in minimum time. So, it also depends on how quickly and eagerly you want the SEO results. Thanks for the great post. According to me hiring a reputed and experienced SEO agency would work best where experienced professionals are working on many sites and have full knowledge of how of SEO. They can very well handle the sites efficiently and have faced challenges to bring the rankings and traffic. And at the end as you said nicely that it depends on budget and needs of your site. Overall it’s very nice post with best suggestions for both the options. Thanks once again for the useful post. I would choose SEO agency over in-house SEO and using the same. Because for me it involves SEO education from scratch, more time and not having proper understanding of current SEO trends like a professional. Very well differentiate advantage of both.